QUIZ ANSWER: WHO IS THE MYSTERY NUMISMATIST? I cannot identify the numismatist in the photo post card, but he is pictured in front of the Great Sphinx and in the background is the second tallest of the three Great Pyramids at Giza, on the outskirts of Cairo, Egypt. This pyramid of Khafre (or Chephren) retains a major portion of its original smooth dressing which shows in the photo. The number 9 at the bottom tied the prints to the customer's order after processing. 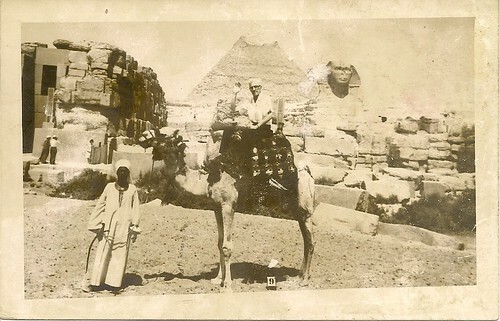 I don't think the mystery numismatist is much of a mystery; he very much looks to me like Abe Kosoff doing the obligatory tourist bit on a camel, in front of the Sphinx, in February or March 1954 while he was in Cairo attending the Farouk sale. I'm gonna guess it's Abe Kosoff on a camel while visiting Cairo for the Farouk numismatic auction in 1954. Howard Gibbs at the Farouk Sale, most likely after he got out of jail. He worked for coal companies and was used to carrying a gun at all times. I believe he was arrested for carrying a weapon as he deplaned in Egypt. He was not held very long and did not miss the sale as I recall. I wonder if this story was told by Schulman in one of the Gibbs sale catalogs? I knew Howard very well, even had dinner at his house in Pittsburgh, but didn't know about his 1964 Egyptian trip. His wife, a very good cook, was famed quarterback Johnny Unitas's mother. How is that for a bit of numismatic-related trivia? Thanks for playing, everyone. I thought this would be a good lesson about NOT jumping to conclusions. I did this myself when I first saw the card, thinking, "Wow - a neat postcard from a Farouk sale bidder." 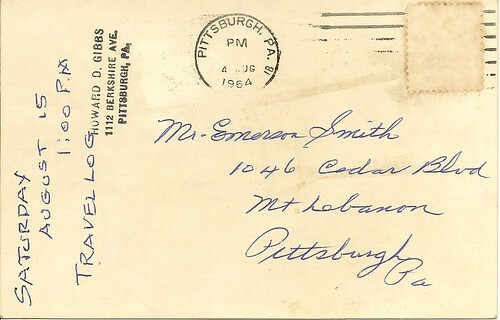 Then I saw the postmark date and thought "Whoa!" I pulled my copy of the Farouk sale off the shelf to confirm the date - 1954, a full decade before the card was sent.